Sweden - For the estimated thirty to fifty percent of adults who snore and their roommates, snoring is no laughing matter but a 99 cent application that runs on iPhone or iPod Touch 4G may provide some relief for this age old problem. 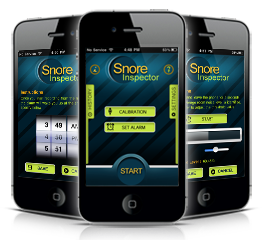 Snore Sleep Inspector, developed by GR Soft Labs in Sweden has proven to be so popular that since its release this past October it has been named "App of the Day" in Sweden, Belgium and the Netherlands and is currently one of the top 25 paid apps in Israel. The idea for Snore Sleep Inspector came about when the roommate of a GR Soft Lab's employee refused to believe that she snored. The application tracks, records and graphs snoring throughout the night, providing information that can be provided to a doctor, should the snorer seek medical attention for the problem. Additionally, the phone can be set to vibrate when the snoring starts, often causing the snorer to change position, which can very often alleviate the problem. Not only can Snore Inspector email snoring patterns to your doctor, for those who think their snoring is entertaining, the application gives them the ability to post their results to Facebook as well. Guy Lukebani, the 35 year old owner of GR Soft Labs told VIN News in an exclusive interview "We have been getting good feedback on the app, some from people who want to prove to their loved one that they snore badly and are worried for them. Others just think it is fun to hear themselves snore. The more feedback we get from people the more improvements we can make." Snore Inspector is due out on Android in January. Lukebani reports that GR Soft Labs will be releasing two more apps in the near future, both of which he deems to be "cool and unique."